So, if you recall, we pulled a permit last November. The first part, which I went over here, was mostly updating electrical, adding recessed lights and a partition wall to the downstairs (along with floors and repainting). The second part was Eve's room. 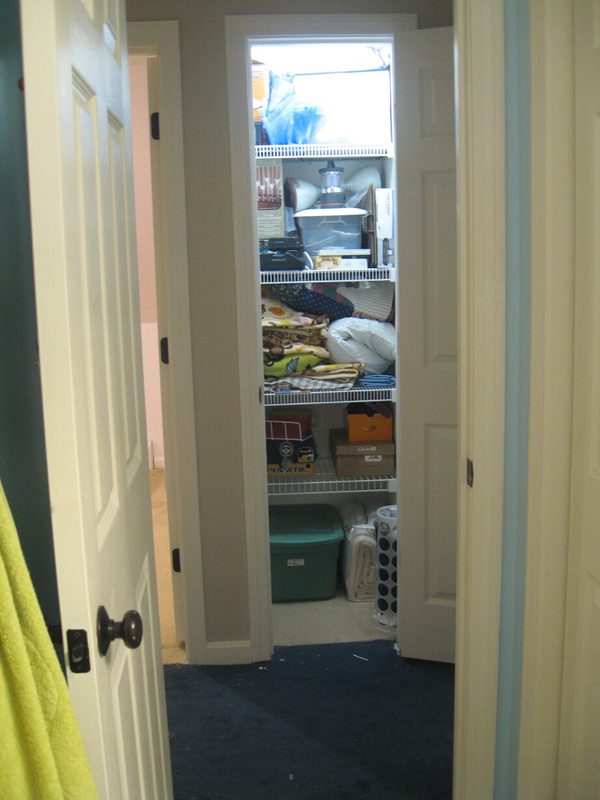 We were rewiring it as well, adding recessed lights, adding a window and moving her doorway and adding a closet. So... 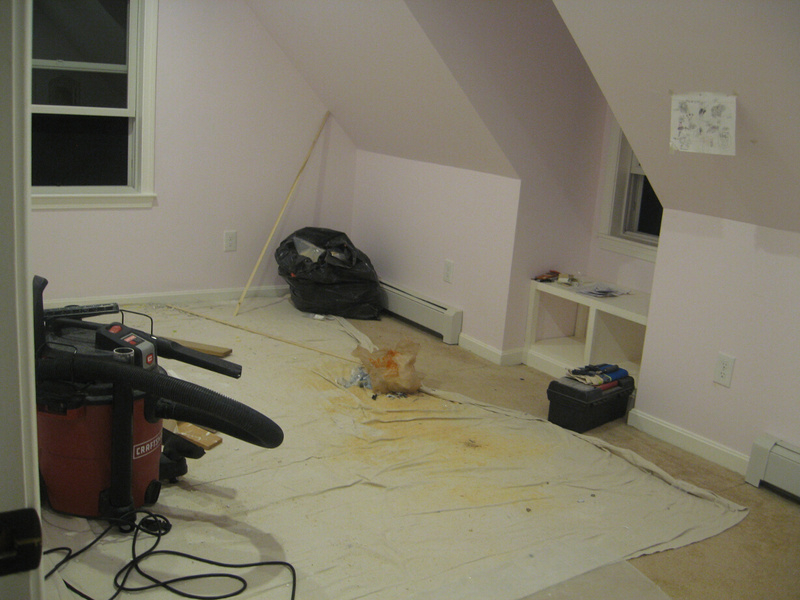 I'm a little bit behind with updates on the progress of the upstairs. We were making great progress, and the goal was to be wrapped up with off this in winter... but pregnancy did bump our plans a little. Okay, a lot. Here's where we were at last time I gave a dedicated update, which was about... mid April. 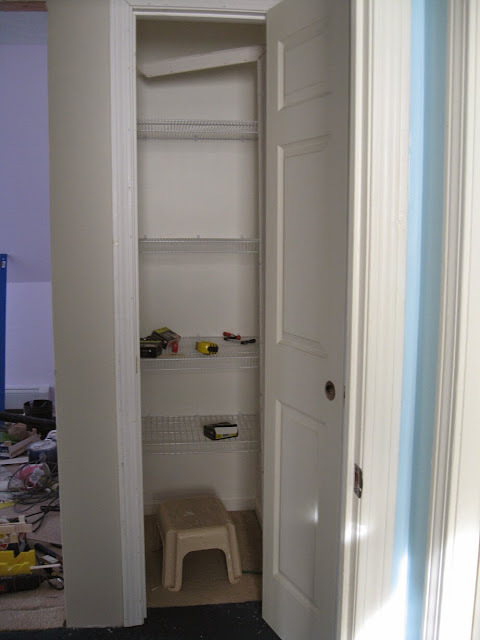 Not very long after our last update, we were able to get the door installed and fill up the closet. The doorknob we got at the restore. That way would match all the other knobs colors with a coat of oil rubbed bronze... and we wouldn't have to spray paint a brand new doorknob. 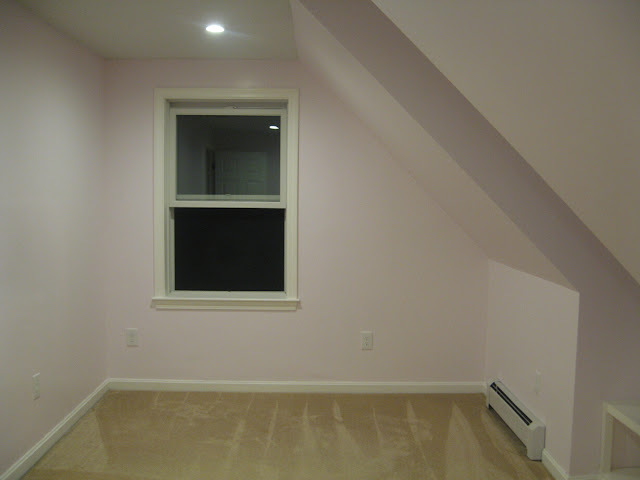 As I mentioned in this post, amidst a ton of other projects, in late June we were able to finish up the drywall on Eve's room. 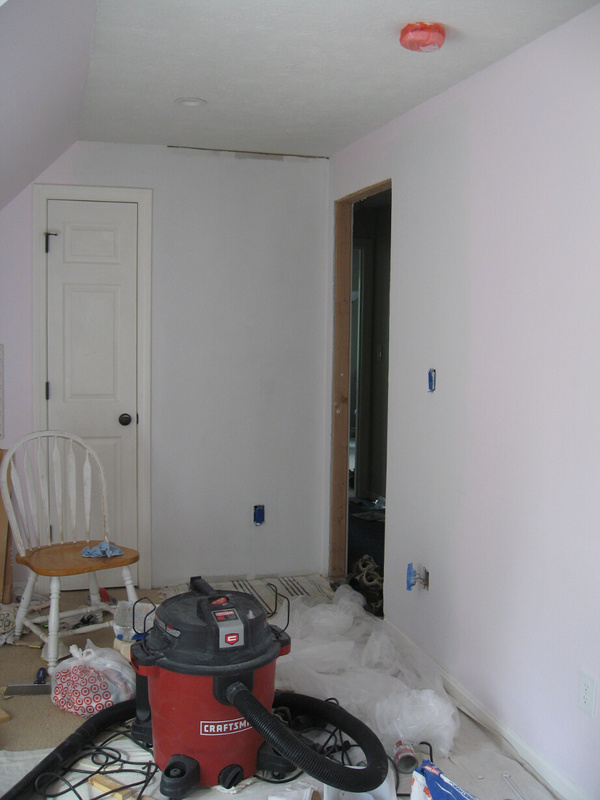 Of course, once Jon wrapped up the drywall, we were super excited and painted it soon after. Sort of uneventful... so I don't have any pictures... but exciting! One bummer, was I forgot the cards to match the color at home... and we got the wrong sheen. Totally noticeable too. 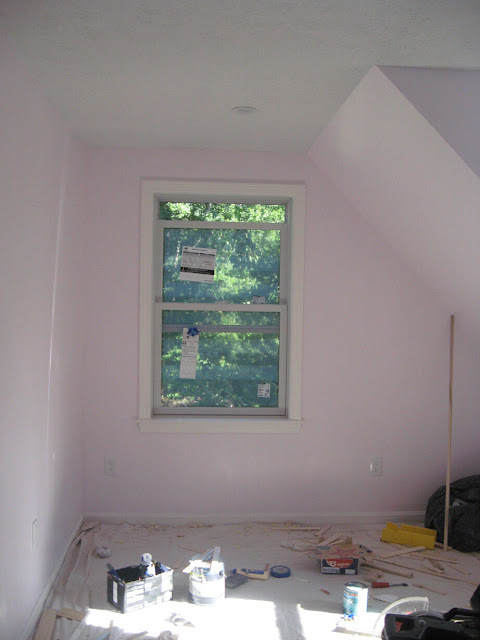 But painting took the room from "construction" to finishing... so who cares are sheen! Once that was all set, we popped all of the outlet covers on and got to finishing work! Jon and I installed the door fairly quickly. It freed up some space in our bedroom (where we were storing it - we used the same one) and helped keep the dust and noise down from the rest of the house. 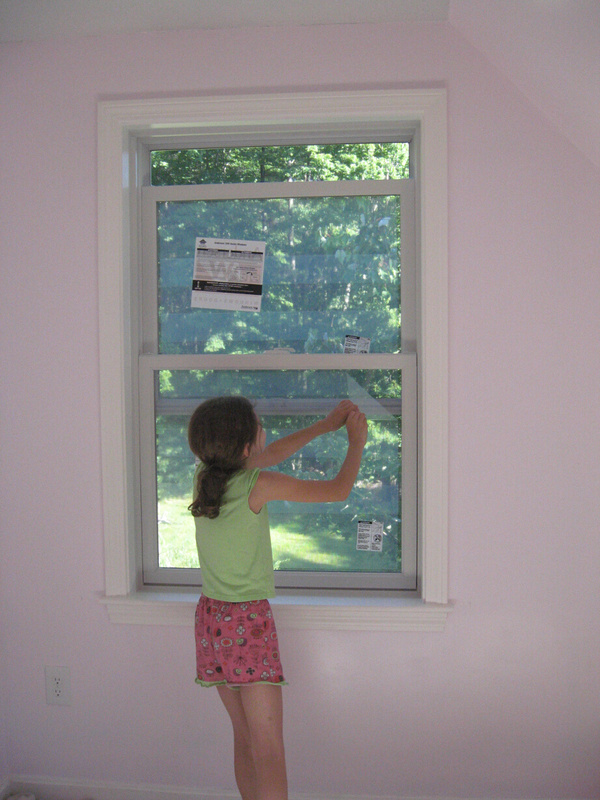 Then I took to framing the window. It took me all of July to frame this window. A total contrast to when I did the boy's room window framing - one weekend to do two windows. I just cannot move quickly when pregnant, and really can't work weekdays, so it was a very slow progress even getting time to try it. And woodworking is not Jon's thing, so having him do it was out. 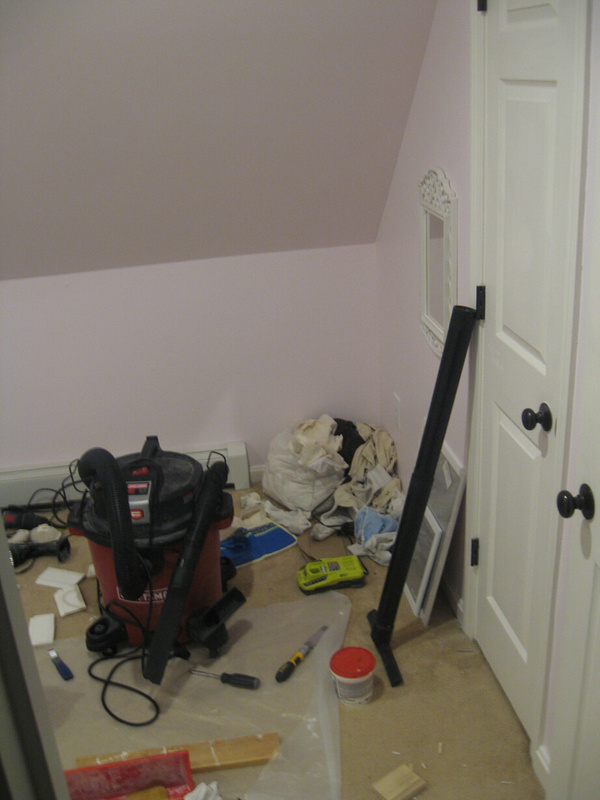 (Plus we were wrapping up the downstairs) trim. 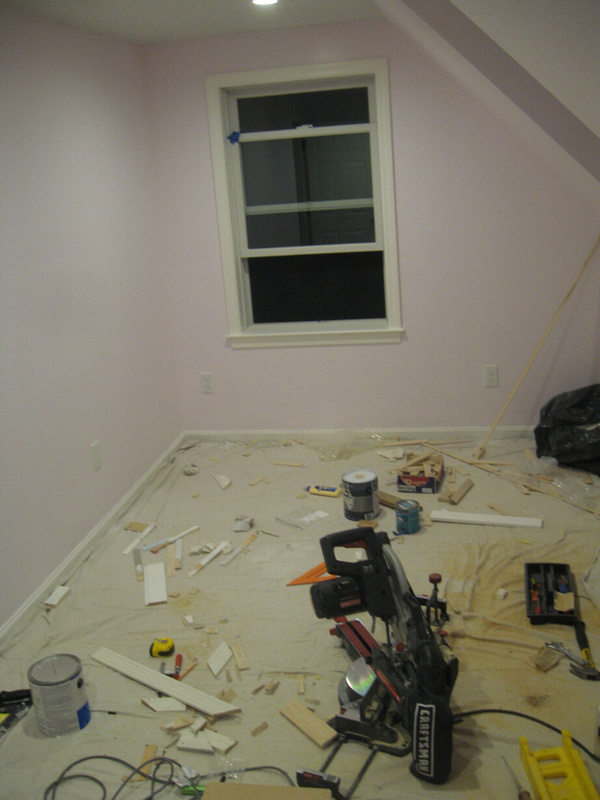 I did make a lot of progress one weekend with my Mom's help and that was awesome. 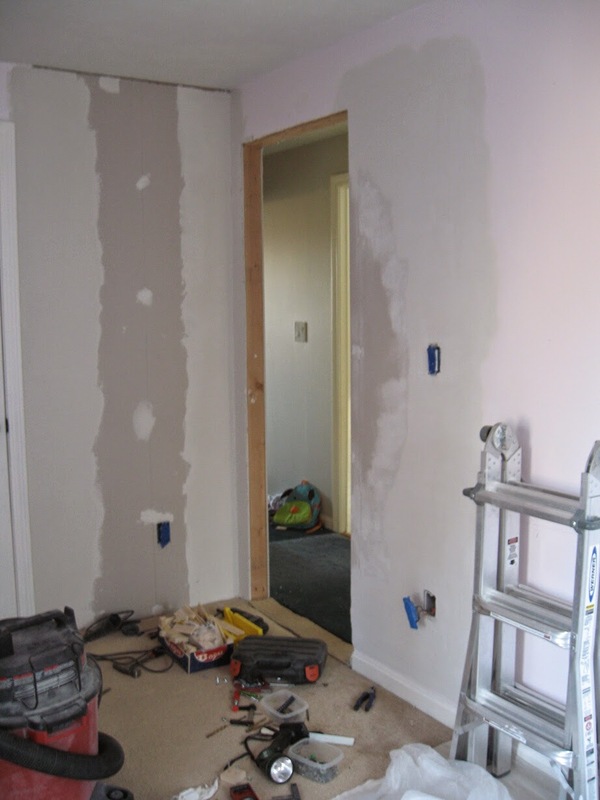 A few days later my sister was around and helped by filling holes with me. Finally, the big day came early August. The window was framed, plugged, caulked and painted. 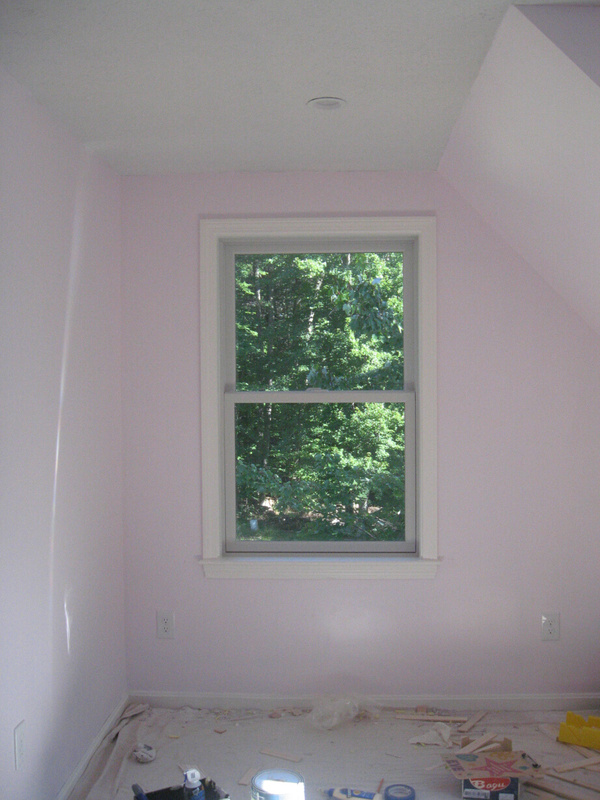 And with that, the window was done! Such a weight lifted to have it complete! While I was working on the window, Jon worked on the trim around the door. 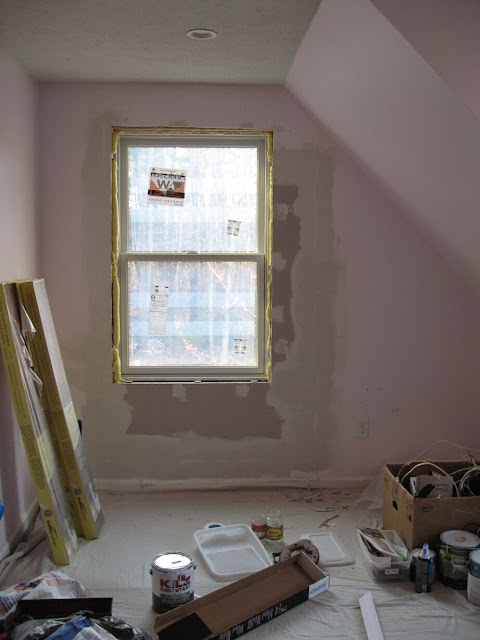 He installed it, filled holes, caulked and painted it. 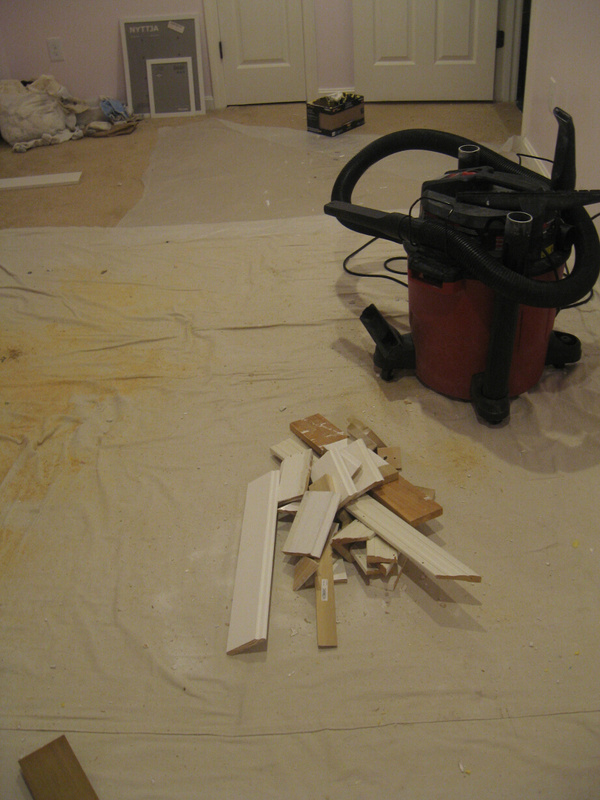 And then, with just a few small baseboard pieces to go mid August, I enlisted Eve's help. She fit the boards after I cut them. 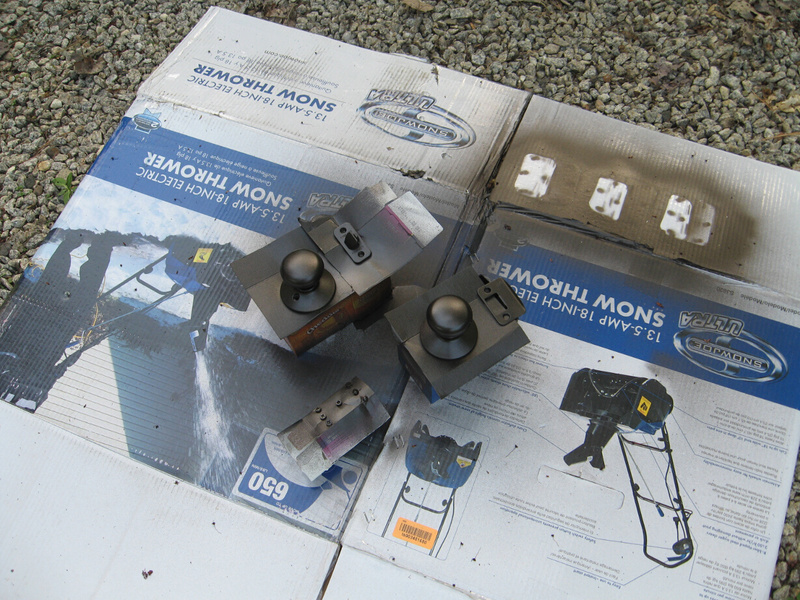 Once those were in, Jon caulked and filled those too. With that.... WE WERE DONE! Oh yeah. One small thing left before out inspection... cleaning! When we installed Eve's door, I told Jon that we should label her door "Workshop" and not "Eve". It had been so long that we kept our tools in there, that it was a least a week for me to get used to not having them in there. After some sorting & moving tools and throwing out scraps and waste, we were all ready to vacuum the drop cloth and haul it out of there. 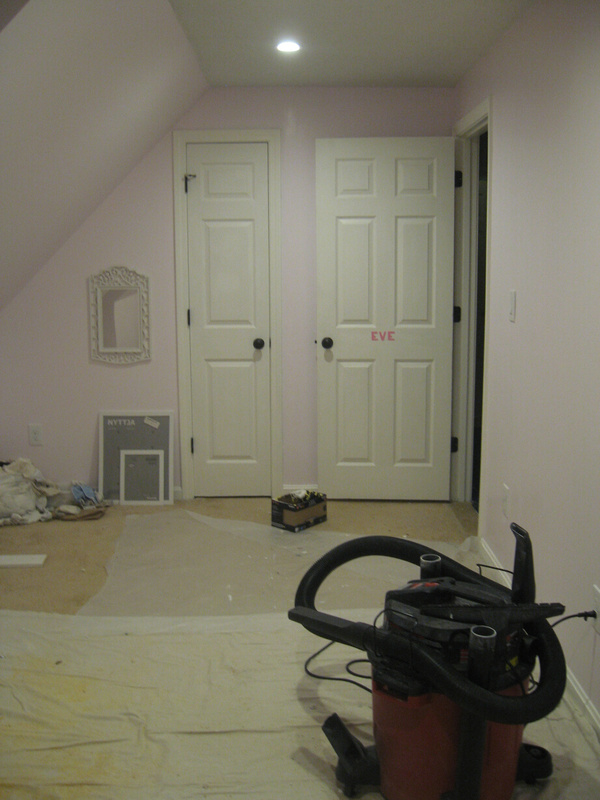 And in one night, Eve's room went from workshop, back to Eve's room! 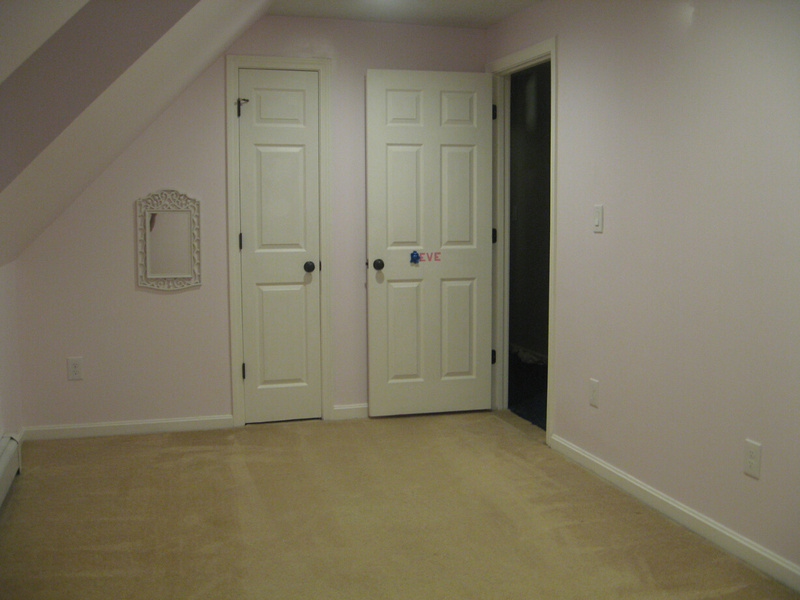 I cleaned the walls while Jon did the vacuuming. 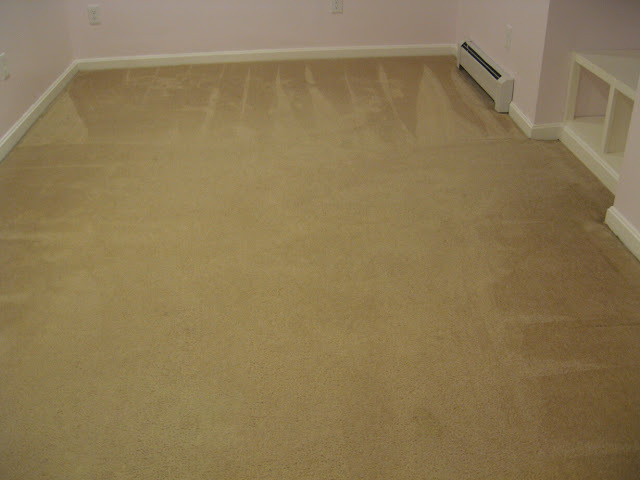 And after a few rounds on the carpet with the shop vac & our normal vacuum, my Mom came over the next day and steam cleaned. It looked and smelled so much better. Totally amazing. So at this point, you'd think we'd have the inspector on the phone that day. ... but we decided to stall just a little bit. Previously, we hadn't put much into her room. 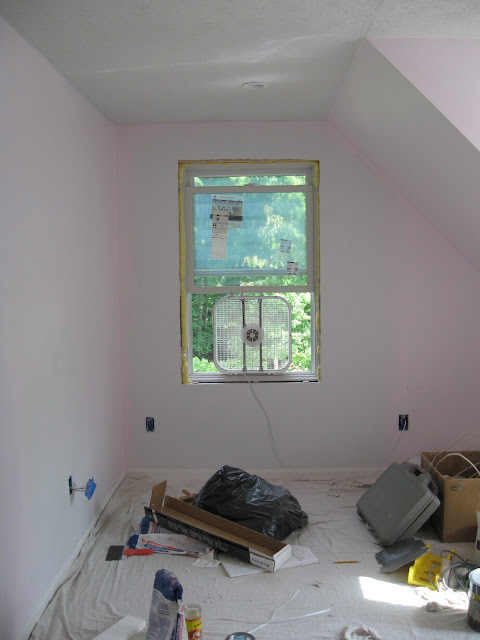 She's always just shared a room with the boys, and when we moved her in after the dormer repair, we knew she'd be moving back out soon enough so we could install a window. 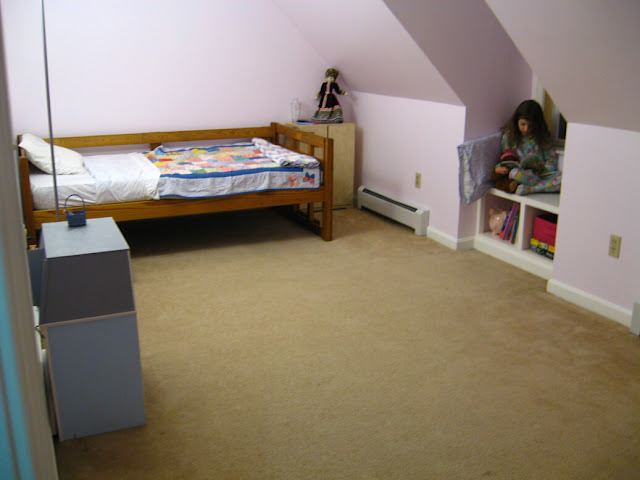 So her room didn't have much.... she had a bed, her dollhouse, a bin of stuffed animals, and the American girl wardrobe my Mom had made her. No decorations. No shelves. Not much to make her room her own. Or even put away her stuff. 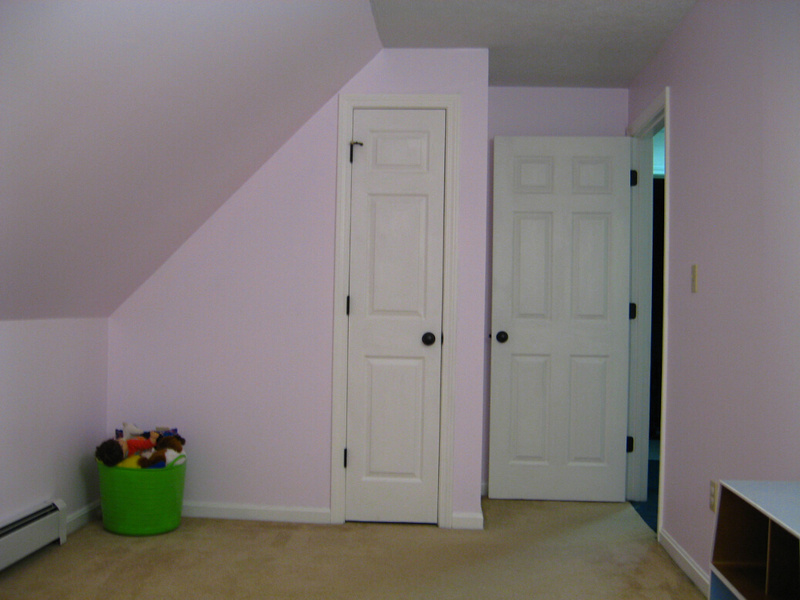 I think after such a long wait, Eve should have a little more grand a reentry to her room, don't you? Well, I think so. Hold on, it's gonna get real.